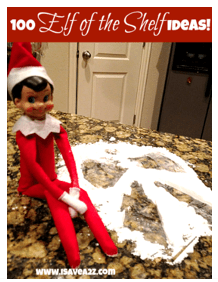 Have you started a fun Elf on the Shelf tradition yet? We started it last year and it was a total blast! Our little guy is very mischievous too. Head over here to see all the photos of his work in this post titled: Our Elf on the Shelf is NUTS!! And yes, we have the boy version. There are 3 girls and one guy in this family so we are trying to even it out! haha! Being mischievous is a bit more fun too. Aren’t boys normally a bit more mischievous anyway?? In this book, the secret is finally revealed about how Santa knows who’s naughty and nice! It’s all thanks to the elf! We have one special rul for our elf though. No one can touch him! If you tough him Santa will know and the magic may disappear with a bad report on you! Our Elf on the Shelf tradition starts the day after Thanksgiving. That’s when he gets his magic back. Santa sends him his magic right to the box. We get him out without touching him to see if he magically appears some where throughout the house overnight! Here’s how it works. Our Elf on the Shelf will move during our sleeping hours! He will leave notes for children, get into trouble, play with your toys, mess up your laundry and even hang from a ceiling lamp or two! It’s so much fun for the kids to read the notes from our Elf on the Shelf but it’s even more fun to see them try to find him in the morning! It definitely encourages good behavior! I have often asked myself if we shouldn’t have this out all year!!! lol! There are times where our Elf on the Shelf has forgotten to move too. Oops! Sometimes during the holidays it’s hard to remember everything but we have made the kids fully aware that this does happen too. Phew…. This has been a super fun and exciting tradition for our family that we plan to continue for a long time. Sometimes it feels like work but most of the time it’s down right quality fun! 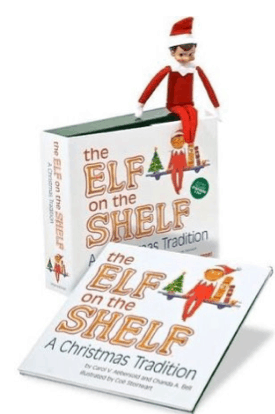 If you are thinking that you are not creative enough to come up with simple or clever ideas I’ve created a fun little download of 100+ Fun Elf on the Shelf Ideas to help get you in the creative spirit! Just head over here to grab the download for inspiration! By Jennifer on September 1, 2018 Amazon Deals, Deals, Freebies, Popular Posts, Trending Topics.